❤ Our hanging toiletry bag features a main compartment with several dividers to keep all your personal items neatly organized and easily accessible without digging for what you need. ❤ Dry & wet separation helps keep the wet from the dry, good for larger items that might leak out, or those "just used" item that you pack away in a hurry. ❤ Waterproof & durable nylon and soft padding provide full protection to your toiletries and other essentials, preventing scratches, spills and bumps. ❤ Our toiletry kit perfectly accommodates all your needs for weekend away, business trips, holidays, camping, dorm room or gym use. 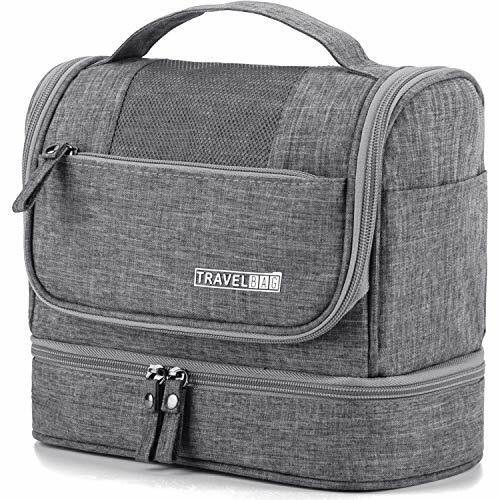 ✅ MULTIPLE STORAGE COMPARTMENTS - One main compartment with several mesh pockets and dividers fit all your travel necessities, neatly organize soap, lotion, shampoo, conditioner, toothpaste, toothbrushes, hair brush, shaving kit, make up and makeup brushes and a few extra items. ✅ SPECIAL DRY & WET SEPARATION - The bottom section is totally waterproof which helps keep wet items like towels, wet toothbrushes separate from the dry. ✅ HIGH QUALITY & TRULY WATERPROOF - Made with durable and waterproof fabric, easily wipe clean and it protects your gears from spills. Reliable zippers to ensure easy opening and closing. It folds up compactly into a small case when not in use. ✅ SMART HOOK - Buit-in hook allows hanging the toiletry kit from towel rack, coat hook or whereever is available, making your toiletries and cosmetics displayed well for easy access and saves counter space as well. ✅ VERSATILE & PERFECT GIFT - The hanging toiletry bag is the perfect size to accomodate all your toiletry needs for weekend away, travel, gym, camping, home use and more. It would be also a great gift for friends and family members. If you have any questions about this product by Narwey, contact us by completing and submitting the form below. If you are looking for a specif part number, please include it with your message.